Conjunction junction what’s your function? I cannot get that school house rock song out of my head after arranging this activity for my second grader! Ahhhhh! Somebody help! Oh well. The focus with this activity was obviously to teach about conjunctions found in sentences. Since I am trying to steer away from worksheets and busy bookwork in my approach to education, I make a constant effort to find and create as many “hands on” forms of learning as possible. This isn’t always so easy when it comes English and grammar. Conjunctions however, proved not as difficult as I thought. I simply printed off 5 conjunctions on card stock paper and hole punched either side of the word. Then I looped colorful paper clips inside the holes. 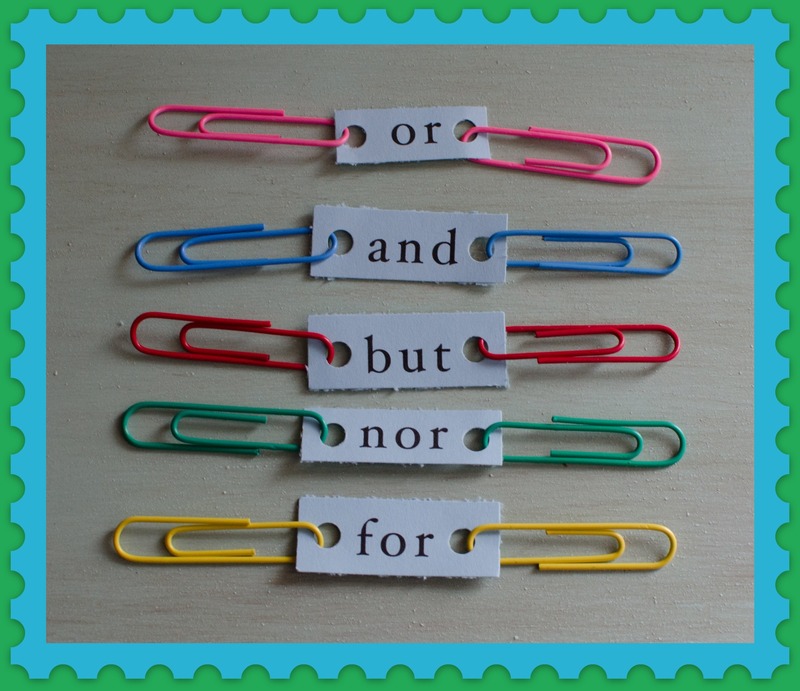 I then typed and printed out a slew of clauses for my little pupil to combine with these conjunctions using the paper clips as fasteners. It’s an easy activity that can be done again and again. The time it took to construct the conjunctions was minimal and they can be used and reused. I may have my second grader write her own clauses as well to intensify the concept even more. All in all I think it’s an activity that will have a lasting impact. Who wouldn’t enjoy and remember colorful paperclips? I know my girls are constantly stealing them out of my drawers to make necklaces and little inventions all the time of their own accord anyhow!